Silicosis is a potentially fatal, irreversible, fibrotic pulmonary disease that may develop subsequent to the inhalation of large amounts of silica dust over time. In most circumstances, silicosis only develops subsequent to substantial occupational exposures. The disease has a long latency period and may clinically present as an acute, accelerated, or chronic disease. The rate of disease progression appears to depend upon the rate of silica deposition in the lungs, as well as the total amount of crystalline silica that is actually retained in the lung. In some cases, silicosis may be associated with other diseases including tuberculosis, cancer, or autoimmune disease. We present an unusual case of silicotuberculosis, confirmed dramatically on the bronchial lavage that showed birefringent crystals under the polarizing microscope-similar to bright asteroids! A 43-year-old male, working as a sand blaster for the past 13 years, presented with fever, cough, breathlessness, and right-sided pleuritic type of chest pain of a duration of 2 months. 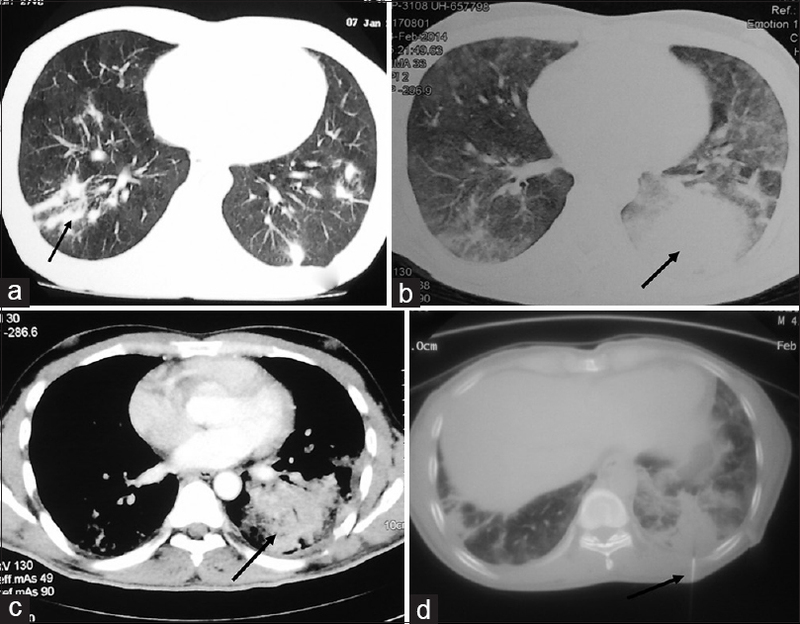 He had been evaluated in another hospital where he was diagnosed as sputum-negative pulmonary tuberculosis based on contrast-enhanced computerized tomogram (CECT) chest and bronchoscopy findings. The computerized tomogram (CT) done 3 months prior to presentation showed nonspecific patchy parenchymal opacities [Figure 1]a. He was started on antitubercular treatment (ATT). But his symptoms worsened and repeat CECT of the chest done a month later revealed features suggestive of nonresolving pneumonia. There were larger and newer parenchymal opacities, predominantly in the lung bases. His breathlessness had worsened since 2 days and on admission his saturation (SpO 2 ) was 70% on room air and 90% with 5 L oxygen through Hudson's mask. On examination, he was emaciated and had bilateral end-expiratory crepitations. His erythrocyte sedimentation rate (ESR) was 86 mm/h with leukocytosis. His two sputum samples were negative for acid-fast bacilli (AFB) on Ziehl-Neelsen (ZN) stain. High-resolution CT (HRCT) of the chest showed bilateral middle and lower lobe ground-glass opacities with left lower lobe consolidation [Figure 1]b and c. CT-guided biopsy of the left lower lobe lesion was performed [Figure 1]d to rule out the possibility of malignancy and histopathological examination showed features of interstitial pneumonia with fibrosis. The papanicolaou (PAP) stain on bronchial lavage revealed benign squamous cells, pigment-laden macrophages, and extensive acute inflammatory cell infiltrate [Figure 2]a and b. The lavage fluid was positive for AFB as demonstrable by ZN stain. 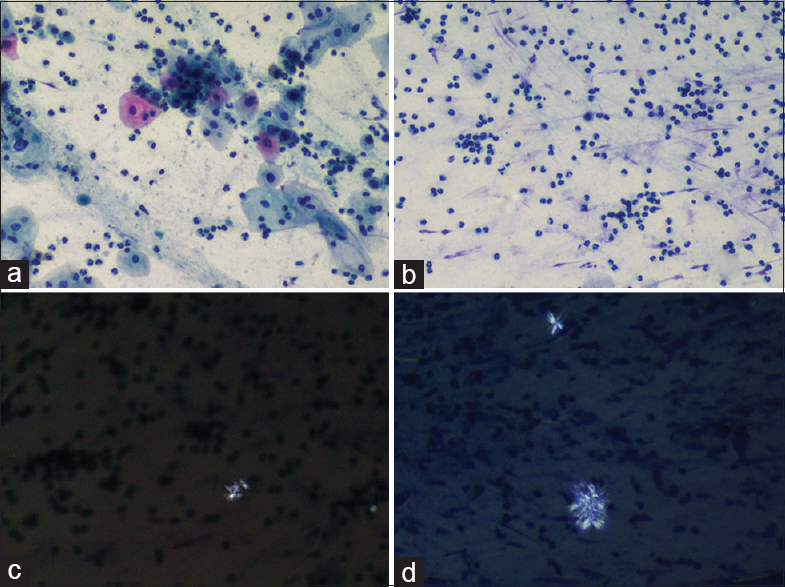 Detection of numerous birefringent silica particles under polarizing microscope in the bronchial lavage [Figure 2]c and d, otherwise not appreciable on PAP stain, clinched the primary diagnosis of silicosis with associated tuberculosis. Initiation of ATT was done as per the patient's body weight. However, his hypoxia persisted and he was discharged on domiciliary oxygen. Repeat chest radiograph at end of 1 month did not show any radiological improvement. His respiratory failure persisted and he was continued on the domiciliary oxygen. Silica particles show birefringent granular or irregular crystals under polarizing microscopy. The closest differential diagnosis for silicosis is asbestosis and talcosis. The most important feature differentiating asbestos-induced pulmonary fibrosis is the presence of parietal pleural thickening in association with lung fibrosis and the presence of asbestos bodies in bronchoalveolar lavage fluid. Asbestos fibers appear as elongated fibers while talc particles appear as needle-shaped crystals inside or outside the macrophages. , A long standing occupational history of exposure to these minerals is generally present as well. There is no proven specific therapy for any form of silicosis. Symptomatic therapy should include treatment of airflow limitation with bronchodilators, aggressive management of respiratory tract infection with antibiotics, and the use of supplemental oxygen to prevent complications of chronic hypoxemia. Lung transplantation should be considered for people with end-stage silicosis. Silicosis is a preventable disease. Primary prevention through exposure control is the critical component of silicosis prevention, health monitoring of workers with exposure to respirable crystalline quartz using chest radiographs, and spirometry may assist in the early identification. Polarizing microscopy examination for crystals is compulsory in all patients with relevant occupational history. Muetterties M, O′Halloran Schwarz L, Sandblasters WR. In: Greenberg M, editor. Occupational, Industrial, and Environmental Toxicology. 2 nd ed. Philadelphia, PA: Mosby; 2003. American Conference of Governmental Industrial Hygienists. Threshold Limit Values and Biological Exposure Indices. Cincinnati, OH: American Conference of Governmental Industrial Hygienists (ACGIH); 2002. Glindmeyer HW, Hammad YY. Contributing factors to sandblasters′ silicosis: Inadequate respiratory protection equipment and standards. J Occup Med 1988;30:917-21. Akgun M, Araz O, Akkurt I, Eroglu A, Alper F, Saglam L, et al. An epidemic of silicosis among former denim sandblasters. Eur Respir J 2008;32:1295-303. Kreiss K, Zhen B. Risk of silicosis in a Colorado mining community. Am J Ind Med 1996;30:529-39. Wang XR, Christiani DC. Respiratory symptoms and functional status in workers exposed to silica, asbestos, and coal mine dusts. J Occup Environ Med 2000;42:1076-84. Duchange L, Brichet A, Lamblin C, Tillie I, Tonnel AB, Wallaert B. Acute silicosis. Clinical, radiologic, functional, and cytologic characteristics of the broncho-alveolar fluids. Observations of 6 cases. Rev Mal Respir 1998;15:527-34. Yucesoy B, Vallyathan V, Landsittel DP, Sharp DS, Matheson J, Burleson F, et al. Polymorphisms of the IL-1 gene complex in coal miners with silicosis. Am J Ind Med 2001;39:286-91. Honda K, Kimura A, Dong RP, Tamai H, Nagato H, Nishimura Y, et al. Immunogenetic analysis of silicosis in Japan. Am J Respir Cell Mol Biol 1993;8:106-11. Hnizdo E, Vallyathan V. Chronic obstructive pulmonary disease due to occupational exposure to silica dust: A review of epidemiological and pathological evidence. Occup Environ Med 2003;60:237-43.
International Agency for Research on Cancer. IARC Monographs on the Evaluation of Carcinogenic Risks to Humans: Silica, Some Silicates, Coal Dust, and Para-Aramid Fibrils. Geneva, Switzerland: World Health Organization; International Agency for Research on Cancer; 1997. p. 337. McDonald JC, McDonald AD, Hughes JM, Rando RJ, Weill H. Mortality from lung and kidney disease in a cohort of North American industrial sand workers: An update. Ann Occup Hyg 2005;49:367-73. Sonnenberg P, Murray J, Glynn JR, Thomas RG, Godfrey-Faussett P, Shearer S. Risk factors for pulmonary disease due to culture-positive M. tuberculosis or nontuberculous mycobacteria in South African gold miners. Eur Respir J 2000;15:291-6. Chang KC, Leung CC, Tam CM. Tuberculosis risk factors in a silicotic cohort in Hong Kong. Int J Tuberc Lung Dis 2001;5:177-84. Cox-Ganser JM, Burchfiel CM, Fekedulegn D, Andrew ME, Ducatman BS. Silicosis in lymph nodes: The canary in the miner? J Occup Environ Med 2009;51:164-9. Chong S, Lee KS, Chung MJ, Han J, Kwon OJ, Kim TS. Pneumoconiosis: Comparison of imaging and pathologic findings. Radiographics 2006;26:59-77. Marchiori E, Lourenço S, Gasparetto TD, Zanetti G, Mano CM, Nobre LF. Pulmonary talcosis: Imaging findings. Lung 2010;188:165-71.